The most exciting part of our grand adventure so far is about to commence. We are loaded up with 1500 gallons of fuel, have our water tanks full with 400 gallons of water (we can make our own with our water maker which is great!) and have all 5 refrigerators and 2 freezers stocked. I can't imagine anyone needing anything...I'm hoping we covered it all! The last inspector on board wanted to know where we purchased the meat in our freezer. Luckily it was purchased in the USA, and we passed our safety inspection with flying colors. Phew. We will be going through the Panama Canal on MONDAY, DECEMBER 22. I don’t know what time we will start but it should be fairly early in the morning like 7AM EST. I'm sure we will be up around 5am-ish to prepare. (That will be about 2am according to our west coast body clocks..e-gads!) We may need a catnap. We will meet our pilot between buoys 2 and 4 in a certain area prior to heading through canal. We provide food, drinks and baño access to him. The pilot doesn't captain our vessel, however he will instruct Brad that best way to navigate the locks as he communicates with his peeps on land. We will start by going up through the Miraflores Locks on the Pacific Side. Next we will traverse Lake Gatun which is 28 miles of easy cruising on a lake. Then we finish by going down through the Gatun Locks on the Atlantic Side. If we get through in one day, which is the goal, this should take a total of about 8 hours. The Canal Authority has several webcams that are mounted at both sets of locks and you can follow our progress if you would like. These webcams are not real time live action. They take a picture about every minute all day long. Hit the "refresh" button on your browser for updates...or you can google "Webcams Panama Canal". The first site shown below shows the Miraflores Locks Camera. I believe there are actually two cameras and they switch from one to another. The good thing about this website is at the bottom where it shows “AIS Ship Tracking.” All of the ships that are moving are represented by a triangular shaped icon and all of the ships that are at anchor are represented by a square icon. Simply hover your cursor over an icon to see if it is INCOGNITO and then you can see our speed and where we are at all the way through the Canal. 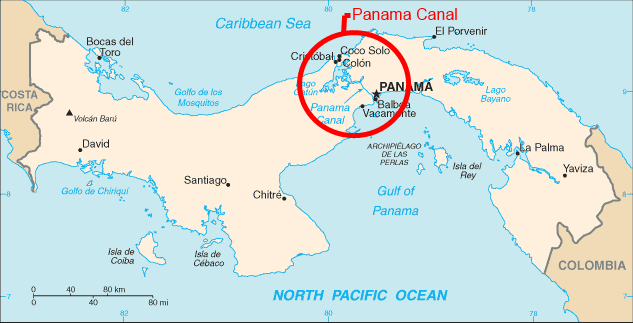 The Miraflores Locks are near the bold word PANAMA on the bottom of the Panamanian Isthmus. Just zoom in, scroll around a bit, and you will see “Lagos Miraflores.” The locks are on either side of that. Now you know how to find us and follow our progress through the Canal. Click on this link below... Once there, you can also click on the images of the ships in the AIS Map. Can you find us? And for the record...I have no idea why my font keeps changing and goes from large to small. Sorry about that...get out your readers if you need them! You can find INCOGNITO now by going to the AIS Ship Tracking chart, locate the bold word PANAMA, move the chart so that word is in the middle, then zoom in almost all the way in. 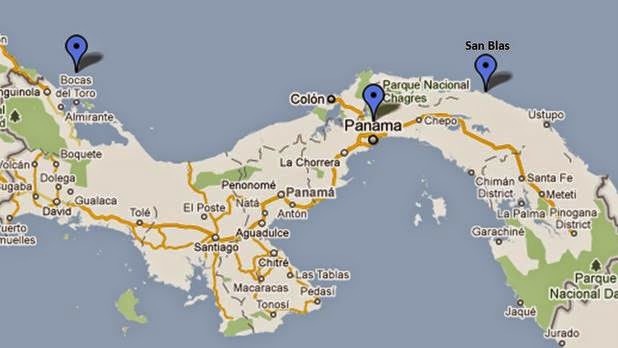 Below PANAMA you will see “Flamenco Marina” at the end of a long peninsula. Move the chart with your cursor to put Flamenco Marina in the middle of the chart and then zoom in all the way. You will see a gray square in the marina. Hover your cursor over it until you can see the word INCOGNITO pop up. That’s right. You can also go to the marine traffic website too.... This is the direct link. We have had some repairs done while we were home last week...getting our props and prop shafts repaired from an impact with a tree trunk (guessing) in the middle of the night on our way south from Costa Rica. The work progressed nicely and was luckily done in time for our family Christmas voyage! And...this didn't occur when the boat was put back in the water...thanks oodles. This second website below has more camera choices! See the tabs at the top of the image. 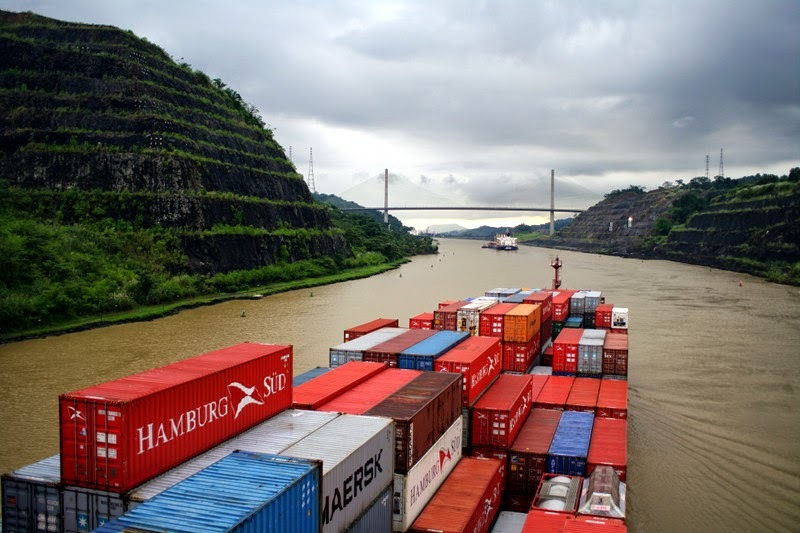 You can see images from the Miraflores Locks at the beginning and the Gatun Locks at the end. You will know our approximate time to go through each of them by following the INCOGNITO icon on the AIS Ship Tracking chart. Easy right? We’ll try to wear color coordinated swim suits for your viewing pleasure. Brad loves his speedos! Many of you have asked lots of well thought out questions pertaining to our passage and what is required to take a private boat thorough the canal. Therefore, I thought I'd provide you the long list of "411" that we were provided by our agent to give you an idea of what is expected and what we will be doing & where we will be doing it. 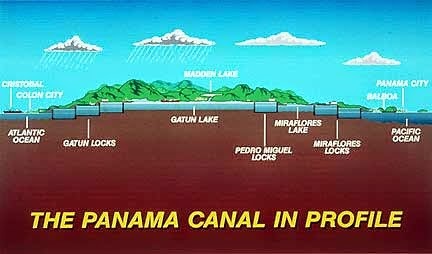 Panama Canal is 50 miles long from deep water in the Atlantic to deep water in the Pacific. It was cut through one of the narrowest places and at one of lowest saddles of the long isthmus of Panama, which joins the North and South American continents. The original elevation was 312 feet above sea level where it crosses the Continental Divide in the rouge mountain range. The Canal runs from northwest to southeast with the Atlantic entrance being 33.5 miles north and 27 miles west of the Pacific entrance. The airline distance between the two entrances is 43 miles. It requires about 9 hours for an average ship to transit the Canal. During this brief time, the passengers aboard have the opportunity to see one of modern wonders of the world in operation. 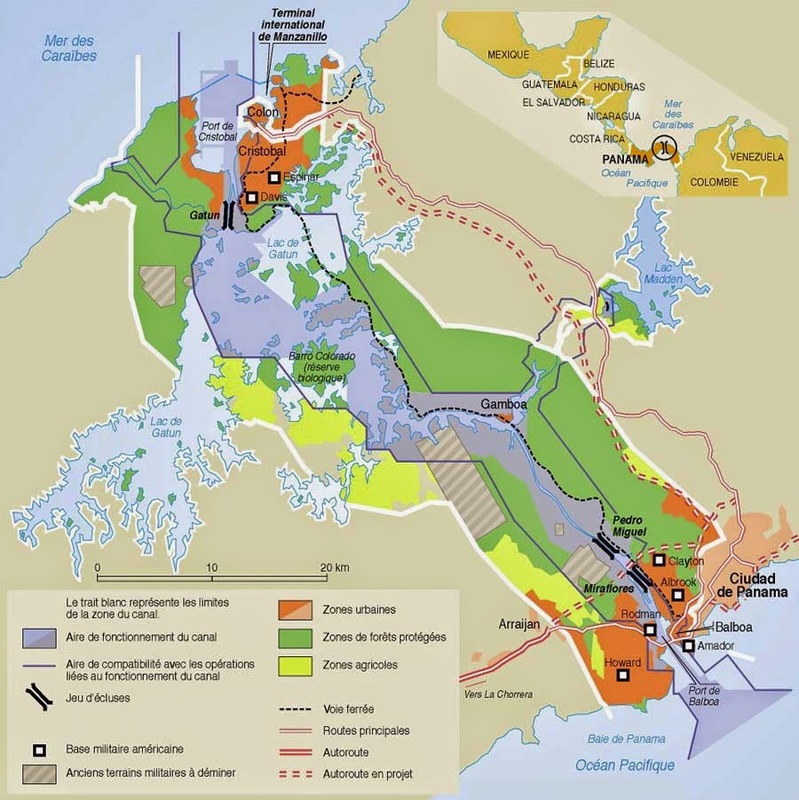 Its principal physical features are the two terminal ports, shorts sections of the channel at either end at sea level, the three sets of twin locks, Gatun Lake and Gaillard Cut. A ship that goes through the Canal from the Atlantic to the Pacific should enter the channel from Limon Bay at the Cristobal breakwater. The sea level section of the Canal on the Atlantic side is 6.5 miles long. This section of the channel is 500 feet wide and runs through a mangrove swamp where the trees are only a few feet above sea level in most places. A ship is raised or lowered 85 feet in a continuous flight of three steps at Gatun Locks. Each lock chamber is 110 feet wide and 1000 feet long. The length of Gatun locks, including the two approach walls is 1.2 miles. 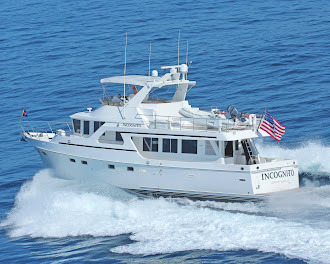 Yachts and small vessels less than 125 feet (That's us!) in length arriving at the Pacific entrance or Cristobal entrance of the Panama Canal require certain clearances. If the vessel plans to transit the Canal, and has a local agent, they will be boarded shortly after arrival by the Panama Canal Authority Boarding Officers and cleared for quarantine so they can go ashore. The agent will make an appointment with the appropriate Admeasurement Office to have the vessel measured and required inspections completed prior to transit. The Agent will guarantee the proper payments required for transit. to their initial transit or their first transit after modification to the vessel’s structure. b. After being measured and inspected, the vessel will be issued three forms. The first is the Admeasurement Clearance and Handline Inspection Form (No Agents). This allows the master to go to the Citibank in Balboa or Cristobal during their office hours between 8:00 AM and 2:00 PM, during weekdays only, to pay for the transit. The payment can be made in cash in U.S. dollars, or by credit card. The total payment includes a transit fee and a buffer. The buffer is used in case additional charges are incurred (in case someone is a speed demon?) during the transit and in most cases, it is refunded. The total fee is based on overall length. c. The second form is the Handline Lockage Request which you will be provided a Copy. This form includes the type of lockage, a physical description of the vessel, and the equipment required to be aboard during the transit. This form is delivered by the Admeasurer to the Canal Port Captain for his approval. The approved copy is given to the scheduler to assist him in assigning the vessel to the transit schedule. contact the appropriate Signal Station announcing its arrival and requesting anchoring instructions. The Signal Station will direct the vessel to the anchorage and give any operational restrictions that may be in effect. In no case shall handlines be allowed to pass beyond the Bridge of the Americas northbound, or beyond buoys 3 and 6, Limon Bay, southbound, without the services of a Canal pilot or transit advisor. b. Small vessels transiting as hand lines will normally transit during daylight hours. Exceptions may be made by the proper authorities. c. The Panama Canal authority shall deny transit if a handline vessel cannot maintain a speed of 4 knots. However, a vessel may be towed through the Canal by another handline vessel if it can tow her at 4 or more knots, or make arrangements to be towed, at their own expense, by a Panama Canal Authority launch. Sailboats cannot transit the Canal under sail. They must transit with motor propulsion. If the vessel is equipped with an outboard motor as its primary propulsion, it must have a reverse. The operator must be able to control the outboard motor from the cockpit, or else, the vessel may need a Port Captain’s inspection. a. All handline vessels are required to be equipped with 4 ropes, of adequate strength. (We rented ours from our canal agent, along with some tires) The 4 ropes are sized for our vessel to maintain its stability in the lock chamber under strong turbulence. We have to be careful not to get in a tugs backwash as it can spin us around. Who knew?! I hope we don't stop short.. These ropes must be a minimum of 125 feet (38 meters) long and have a loop tied on one end about three feet in diameter. The ropes must be free of knots or splices in order to pass freely through the chocks. (Yes, we all have our own pairs of gloves to handle the lines with.) The vessel must be equipped with adequate fenders, at least 4 to prevent damage from making contact with the rough concrete of the chamber walls during lockages. Normally, ropes and tires for fenders can be rented from local yacht clubs, or shipping agents if needed. It is the vessel’s responsibility to have enough fenders on board and properly placed. (I can't even imagine how dirty the sides of our boat will be after tires spend a day rubbing against it!) All vessels must have an anchor capable of being retrieved without delay. The vessel must be equipped with a working whistle or horn. The vessel should have a toilet on board (really?) or they could experience delays while relieving the pilot or transit advisor. The vessel should provide the pilot or transit advisor with a meal (Top Ramen?) and fresh drinking water (duh), or there could be an additional charge to provide these items for them. An awning should be installed over the cockpit to provide the transit advisor and crew with shelter from the sun and rain. After inspection, the Canal Port Captain will determine whether your vessel transits the Canal as a "center chamber" or "sidewall" handline lockage. We have requested "center chamber" & "Nested". This determination is based on hull configuration, protruding railings, awnings, tall masts, spars or anything else which could be damaged when made fast alongside Chamber walls. On up-lockages, heavy turbulence is encountered. Consequently, all lines should be inspected for condition and should be of sufficient size and strength to hold the vessel under heavy strain, recommend at least 7/8” in diameter. Line handlers (that will be myself, Carly, Kat, Matt & Matt) must have enough strength and skill to control lines during times of turbulence. Fingers crossed!! Regardless of the type of lockage planned, every vessel must be equipped for center chamber lockage, especially with regard to number of linehandlers and number of mooring lines. Following ship into a chamber, the crew of the handline vessel passes the first bow and stern line to linehandlers on the approach wall at position 1. At position 2, crew passes the second set of bow and stern lines to linehandlers on sidewall of chamber. At position 3 all lines are made fast on board and ashore for flooding operation. Whew...this sounds like a busy Monday we have ahead of us! Chocks and bits or cleats should be inspected to make sure all fittings are in good condition and fasteners well secured. They will be under heavy strain during the transit. The area around these fittings must be clear of gear so that the lines can be safely and efficiently handled. We've been told that if our boat is damaged due to faulty or insufficient equipment or improper handling of boat or equipment by the crew, the loss of time and expense will be our$. When asked, we will be sure to tell the Canal Port Captain the correct top speed that our vessel can sustain. There can be hazardous currents associated with the transit, and it is important that our vessel be able to maintain a safe speed at all times. Vessels, which cannot sustain a speed of at least four (4) knots (We laugh at 4 knots! A snail can go faster...), and vessels without properly operating engines should make arrangements to be towed through the Canal. A Panama Canal Commission launch can perform this towing service with all towing charges at ones expense. If, at the start of the transit, the craft cannot maintain a safe speed, as reported to the Canal Port Captain, the craft will be turned around and returned to the starting point. If this occurs, an aborted transit charge will be billed to the craft. We'd have to do a quick reverse...which won't even happen on our watch. Normally for sailboats or slow vessels, the transit will take two days. 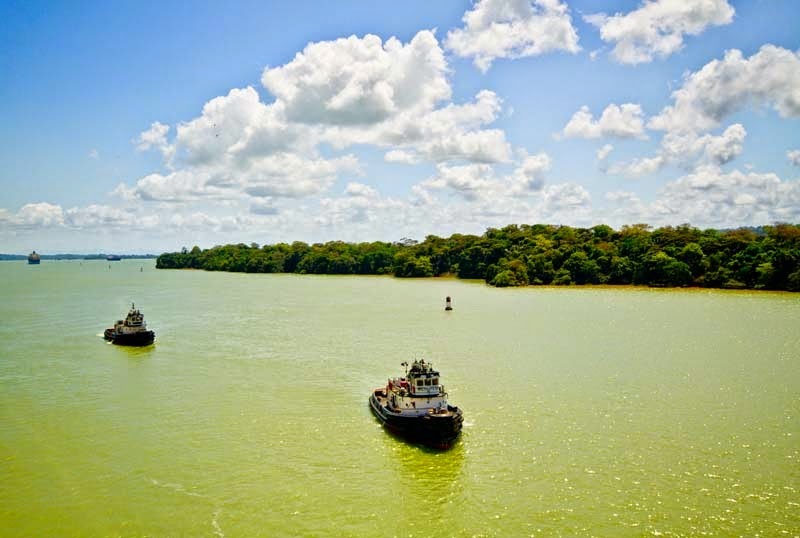 If the vessel must anchor for the night at Gamboa or Gatun Anchorage, no one other than Panama Canal Authority personnel are allowed to go ashore (watch out for the crocodiles!) without the Port Captains permission and then only on PCA launches. No dinghies or rowboats are permitted. If one is unable for any reason, to commence a scheduled transit, your vessel will be charged a fee of $295 for delay, unless the transit was canceled prior to close of regular business hours on the day immediately preceding the scheduled transit. Hopefully, this will prevent the unnecessary call out of a pilot or transit advisor. wah...wahh. Gatun Lake, through which the ships travel for 23.5 miles from Gatun Locks to the north end of Gaillard Cut, is one of the largest artificial bodies of water in the world. It covers an area of 163.38 square miles and was formed by an earthen dam across the Chagres River adjacent to Gatun Lock. The two wings of the dam and the spillway have an aggregate length of about 1.5 miles. The dam is nearly a half-mile wide at the base, sloping to a width of 100 feet at the crest, which is 105 feet above sea level, or 20 feet above the normal level of Gatun Lake. 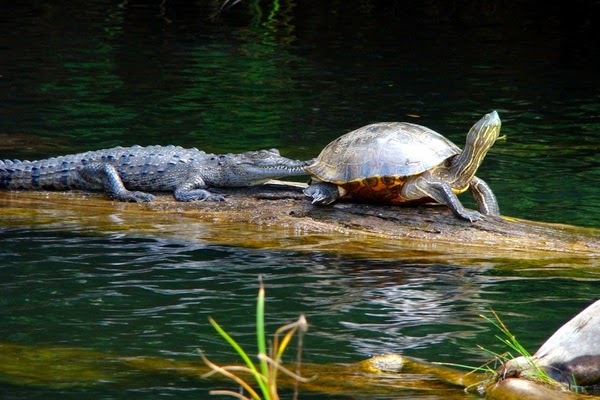 And who knows..we may spot some of these critters! Because of its historical background no part of the Canal trip is more interesting to the ship passenger than the Gaillard Cut. During the Canal construction period it was called Culebra Cut, but was renamed for Col. David DuBose Gaillard, the engineer who was in charge of this section of the Canal work. This portion of the channel is 8 miles long through rock and shale for most of the distance. It was here that the principal excavation was required and the devastating slides occurred during construction and soon after the Canal was opened. The ship enters the Cut where the Chagres River flows into the Canal channel at Gamboa. More than any other section of the Canal, Gaillard Cut gives the impression of an enormous man-made ditch. A short distance before the ship reaches Pedro Miguel Locks it passes Gold Hill on the left, the highest promontory along the channel. It raises 662 feet above sea level. Contractor's Hill, seen on the west bank opposite Gold Hill, originally had an altitude of 410 feet, but this was reduced to 370 to stabilize the hill in 1954. The channel in Gaillard Cut was originally excavated to a width of 300 feet. During the 1930's and 1940's, the straight section immediately north of Gold Hill was widened to 500 feet in order to provide a passing section for large ships, and during the period 1957‑1971, the remaining portions of the Cut were also widened to 500 feet. 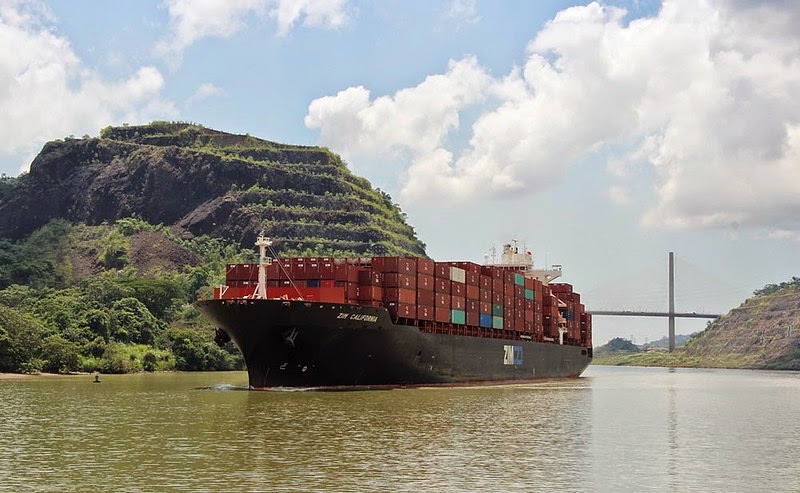 The Pacific‑bound ship enters Pedro Miguel Locks at the south end of Gaillard Cut. Here it is lowered 31 feet in one step to Miraflores Lake, a small artificial body of water a mile wide that separates the two sets of Pacific locks. 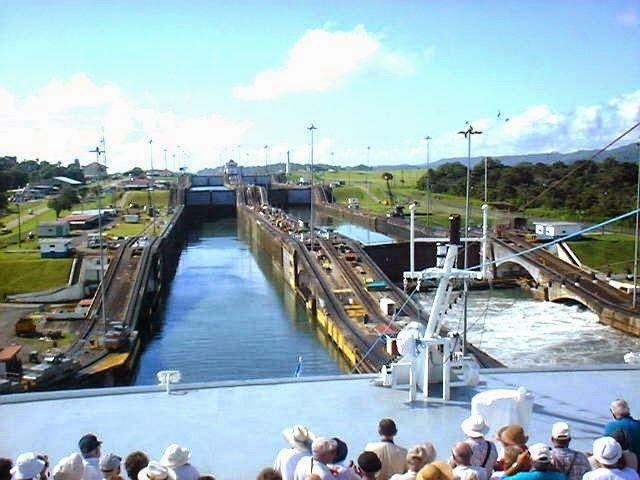 The length of Pedro Miguel Locks is five‑sixths of a mile. The transiting ship is lowered the remaining two steps to sea level at Miraflores Locks which are slightly over a mile in length. The lock gates at Miraflores are the highest of any in the system because of the extreme tidal variation in the Pacific Ocean. We are PSYCHED to experience this!!! Once we transit the canal, we will be at anchor in Shelter Bay Marina for the night. Here are the 3 areas highlighted in blue "pinpoints" where will be. The next morning we will be heading to the San Blas Islands. It should take us a full day to get there. I'm posting all of this now as WiFi in Panama has not been reliable, so I doubt we will have a connection for a bit. Mom, this could mean 4-5 days so don't have a spazz attack! (you can reach us on our SAT phone) It may not be until we get to Bocas del Toro that we find WiFi..so stay tuned! 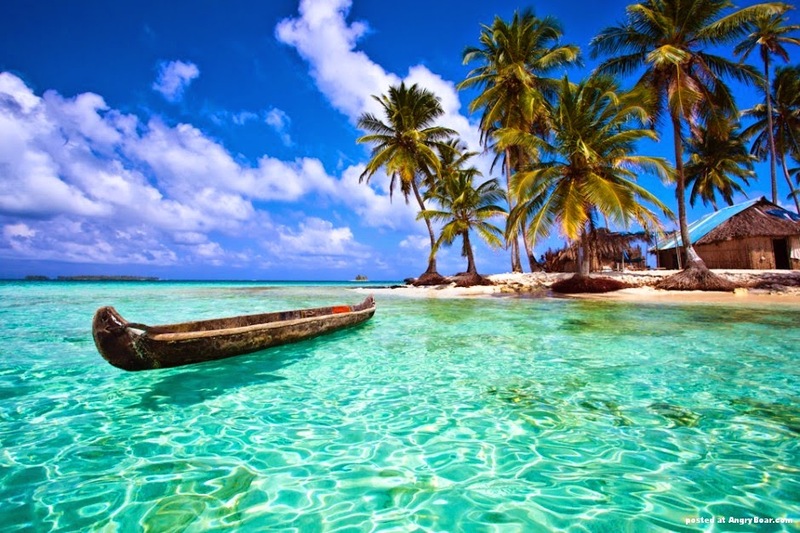 Can't wait to get to San Blas...pure heaven on earth.